Some unwelcome guests are making the beauty of summer in Pure Michigan a little less inviting. We're talking about Canadian Geese and Canadian Geese poop. 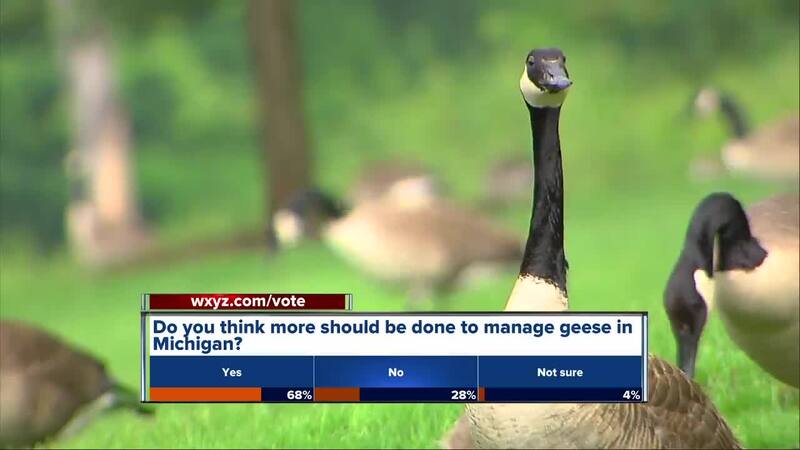 While one Metropark thinks they have something that is helping manage geese. If you’ve been to Lake St. Clair Metropark in the past few years you may have noticed an issue. There’s no reason to tip-toe around it — it’s goose poop — though, to be fair, you likely had to tip-toe around physically to avoid it. An estimated 200-300 geese could be spotted in the area just a few weeks ago, now after a service called “Goose Busters” has been hired on by the The Huron-Clinton Metroparks there’s only believed to be 10-20 geese left on the property at any given time. “Knock on wood, there hasn’t been a whole lot of geese here since we started,” said Chris Compton, the owner of Goose Busters. While you may notice fewer geese, you’ll certainly notice the energetic dog that’s helping fix the problem. Ellee, a border collie, was specially trained along with her “co-workers” to chase geese. Goose Busters is bringing in a dog six days a week at least twice a day. The dogs are trained to chase the geese until the fly away. “It’s hard because geese like the food that’s in the area and they have water so they stick around,” said Compton. On a Wednesday afternoon 7 Action News rode a golf cart around the park to watch Ellee in action — she only came across geese twice in roughly an hour. The dogs are limited in what they can do. They’re not allowed to chase baby geese because they can’t fly yet — the strong waves of Lake St. Clair make it hard to send them into the water, which is why Compton comes with a remote control boat too. If the geese try to wait the dog out in the water, Compton sends his RC boat after them. When Ellee and Compton, along with his boat, started their work in March they were chasing geese for hours. They alternated the time they showed up so geese couldn’t plan around the harassment, now they just avoid the park. 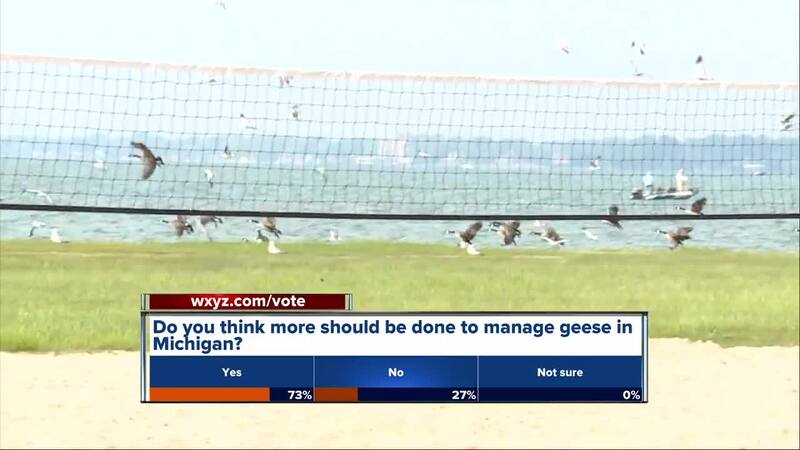 There’s hope that fewer geese means less goose poop, which would also mean cleaner water. Last year, Lake St. Clair Metropark had more than 30 days that E. coli caused the beaches to be closed. It’s an all too familiar issue for lakes and beaches across metro Detroit. And there are real questions about whether geese, specifically an explosion in the Canada geese population, is to blame. “It’s our hope that the part of the problem with the beach closures is the goose droppings and this will help alleviate that,” said Colliton. While it’s too soon to know whether fewer geese will mean fewer beach closures at Metropark beach, there’s hope on the horizon in the form of research happening in Windsor. It’s preliminary data, so nothing in written in stone, but early indication by student researchers and Dr. Daniel Heath at the University of Windsor that beaches could be closing down for E. coli when the levels aren’t harmful to humans. Essentially, they’re looking at water samples on a molecular level which is different than traditional coliform testing that is being done by health departments. By using this new technology students working at the Great Lakes Institute for Environmental Research (GLIER) are able to tell whether the E. coli in water is related to humans, geese, seagulls or other animals. What that means is that beaches may be testing positive for E. coli using an old form of testing, but could be safe for humans to be in. The way lakes and rivers are tested for E. coli now can’t differentiate what type of E. coli is in the water. Dr. Heath believes that the research they’re working on could change testing for the better. Research funding will wrap up in September after three years of work, it’s the hope of Dr. Heath and his GLIER co-workers that they’ll be able to make more definitive statements. If they can it could mean fewer beach closures if the pathogens that trigger traditional tests aren’t harmful to humans. That would have a major impact on businesses on both sides of the border that rely on the Great Lakes, rivers and other large bodies of water for the local economy.